Having hoses get kinked up on them. Having hoses get caught under automobile tires, etc. But there are other reasons to make the switch to an automatic irrigation system, too. Below we will explore some of those reason for homeowners contemplating retiring those annoying garden hoses for good and having sprinklers installed in the lawn. Drip irrigation systems have equipment that discharges water differently and will be covered separately. Even among sprinkler irrigation systems, there are various types of “head” equipment for discharging water. “Spray” heads and “rotor” heads are two of the most common. What Are the Best Sprinkler Heads to Use? Automatic irrigation expert Jess Stryker likens the fixed-spray sprinkler head to "a shower nozzle," because it does not alternate the spraying pattern. By contrast, he remarks that the rotor types "operate by rotating streams of water back and forth or in circles over the landscape." To reinforce the distinction, he evokes a sound with which most readers are familiar: "You probably know this sprinkler best for the distinct sound it makes when operating – tooka, tooka, tooka, tic, tic, tic, tic, tic, tooka, tooka, tooka, etc." Spray sprinkler heads are sometimes designed to pop up out of the ground when the sprinkler system is activated, while others rest on pipes that remain above-ground at all times. Spray heads discharge a large volume of water in a relatively short amount of time, giving them–in irrigation lingo–a “high application rate.” For this reason, sprinkler systems with spray heads are most suitable for even surfaces, not slopes. If you do have to use a spray head on a slope, program your sprinkler system such that water is discharged over several shorter periods. This will help you avoid wasteful run-off. By contrast, the rotor-type sprinkler heads have a lower application rate, so they are simpler to use on slopes. Rotor heads also apply water more uniformly than do spray heads, making them more suitable for watering larger areas. For people who wish to irrigate large areas of lawn, sprinkler systems with rotor heads would be a logical choice. Whether you use spray head sprinklers or rotor head sprinklers for a particular area in your lawn irrigation does matter, because of the difference in application rates. Above all, be consistent in the types of sprinklers you use (that is, spray head or rotor head) within specific areas. Mixing head-types within the same area leads to over-irrigation of some parts of your lawn just to get adequate amounts of irrigation to other parts. The goal of lawn irrigation is to target water distribution as precisely as the system allows. If, instead of watering a lawn, your concern is watering a vegetable garden, flower border, or some other type of planting bed, your needs will be best served by installing a drip irrigation system. Such a system is more efficient in these cases than other watering methods because it allows you to target the root zones of the plants themselves, rather than arbitrarily spraying water around. Sure, you can stand there with a garden hose and water each individual plant, but that is not a very efficient use of your time. Drip irrigation systems, at the most basic level, are constituted of a series of tubes that have holes opened along them at intervals. The location of the open holes is tailored so as to irrigate most efficiently the specific garden beds in which drip irrigation systems will be buried, promoting water conservation. If you have a bed in which perennials are spaced at two-foot intervals, then there will be corresponding holes in the tubing at two-foot intervals, through which water will be discharged. You don’t waste any water with drip irrigation systems because you’re not watering the intervening area between plants. The dripping occurs only where the plants are stationed. Sprinklers, in contrast with drip irrigation systems, spray water into the air first, before it ever reaches the ground. Wind can carry airborne water away, distributing it elsewhere than where it was intended to go–an inefficiency not conducive to water conservation. Drip irrigation systems preclude this unnecessary water loss by taking the water right to the roots. Drip irrigation systems are often installed in areas in which flowers or shrubs are growing (that is, individual elements with spaces between them), as opposed to a lawn. Drip irrigation systems allow you to target plant roots even more precisely than do sprinklers, resulting in better plant health and better water conservation. So-called "irrigation zones" are an element of landscape irrigation design that allows you to target water distribution with precision, thus cutting down on waste and saving you money. The premise behind the concept of "irrigation zones" is simple enough. Before you install your system, you need to decide that area A of your land should get X amount of water, while area B should receive Y amount, etc. Once you have irrigation zones established, you will then program your system accordingly. This is one of the virtues of automatic irrigation systems: you can target water distribution more precisely than by manual watering or by using oscillators. The demarcation of landscape irrigation zones is an issue to consider when planting–well before irrigation design itself. Establish separate beds for your plants according to how much water they need. If plants with similar watering needs are planted together, you’ll conserve water. You’ll also promote plant health by ensuring that one plant isn’t over-watered on account of one of its thirstier neighbors. This planting strategy is sometimes referred to as "xeriscaping." Drought-tolerant shrubs will inhabit one landscape irrigation zone, drought-intolerant perennials another, and so on. The lawn is a landscape irrigation zone all by itself. An area with southern exposure requires more watering than one with northern exposure. Plants get thirstier in summer than during spring and fall, so program your irrigation timer accordingly, rather than always keeping the irrigation timer on the same setting. This will promote water conservation, as will watering at the right time of day and overriding irrigation timers with rain sensors. The time of day when you irrigate is a factor in water conservation. If you program irrigation timers to go on early in the morning, you’ll lose less water to evaporation than if you were to irrigate in the heat of the day. For optimal water conservation, it will be necessary to override the irrigation timer of your automatic system if your area receives heavy rains the night before your system is programmed to run. You’d only be pushing up your water bill unnecessarily. If you’d rather not have to bother overriding your system manually in such cases, install a rain sensor on your roof. Rain sensors can be tied into automatic systems, shutting them off for you after a period of rain. Soil type affects how you irrigate your my lawn. Read more to learn about soil types and how to figure out which type you have. 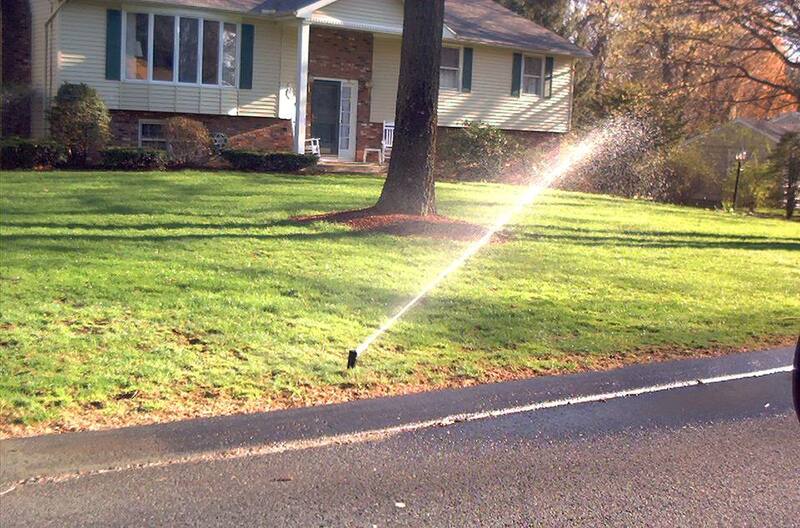 Installation of sprinkler systems should be handled by professionals unless you are good at making complex calculations. If you do decide on a do-it-yourself sprinkler installation, acquaint yourself first with whatever inspection codes for irrigation your town may have. Installing a drip irrigation system, on the other hand, is easy enough to be considered a do-it-yourself landscaping project. Do-it-yourselfers can purchase drip irrigation systems for a minimal cost at some Lowe’s home improvement stores. The kits are inexpensive, assembly is straightforward, and you can install them in as little as one day's time (few tools are required). Even automatic timers for your drip irrigation systems can be purchased, costing as little as $25-$50.